Disclosure: This post is promoted by smartwater. The opinions expressed herein are those of the author. I’ve been attending New York Fashion Week for two years now. Every season I go to the shows that I absolutely love, meeting talented people and connecting with them. It is such an inspiration to me because of the new designs, trends, street style and immense talent on display. Juggling between different shows and events can be a little overwhelming sometimes, so I want to share with you guys my daily routine and the practices that keep me inspired, help me achieve my ambitions and power me through NYFW. I plan what shows I want to go to before NYFW. Different shows can be at different locations. I map out those locations and plan my daily schedule in advance and I always put everything in my planner. I plan my Fashion Week outfits a few weeks in advance as well. Also, I make sure I bring everything I need: notebook, business cards, smartwater, etc. I, of course, make sure my camera is fully charged, and bring an external battery for my phone. I pretty much plan everything that I can think of ahead of time including the small details. After seeing so many shows, trends and street style, I always feel inspired. A lot of times we get inspired in the moment, but forget about them easily. One of the most important things I do is whenever I feel inspired and have some ideas, I write it down in my notebook or put it in my phone. This way I can re-visit it any time I want. It’s a great source for me to get creative and keep the creative juices flowing. 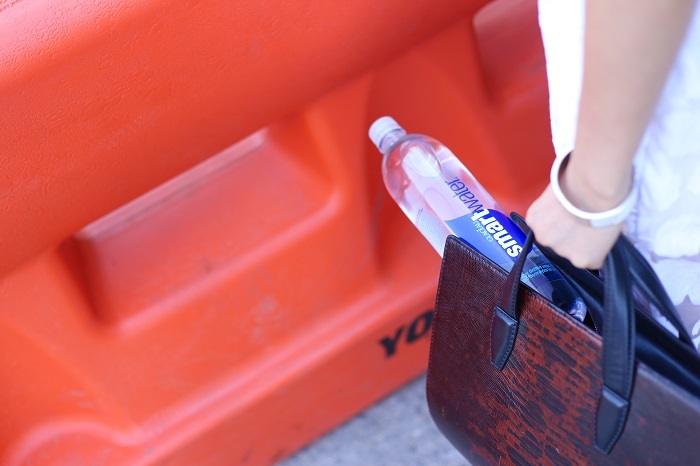 Running around to different shows and events in heels in New York City, I always carry around a bottle of smartwater. 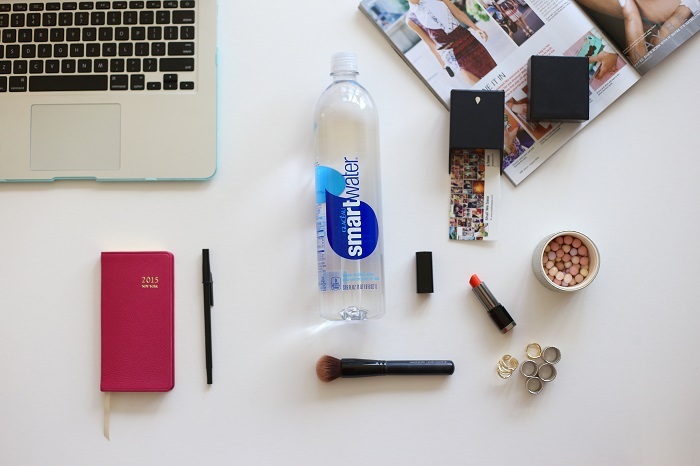 No matter how busy and hectic it gets, smartwater always keeps me hydrated throughout the day. It always helps if you have a positive attitude in life. Sometimes unexpected things happen during Fashion Week, like I’m not able to get a cab or a show gets delayed. No matter what it is, I always remind myself to take a deep breath and stay positive. With positive thinking, I enjoy the busy and intensively creative week so much more. I exercise regularly and this is something that helps me to stay positive on a regular basis. It’s difficult to squeeze in time to go to the gym during NYFW, but I do some simple yoga poses at home at night for about ten to fifteen minutes and it helps me to stay positive throughout Fashion Week. This season I have already seen some inspiring runways, met amazing people at different events and seen new trends. I can’t wait to share with you guys more about New York Fashion Week. I’m a huge believer that success is a sum of small steps. Rome was not built in one day and I enjoy the process every step of the way. I hope that my daily routine during New York Fashion Week has been informative and helpful. How are you guys powering through New York Fashion Week? Great tips, water is my everything for days when I am on my feet!! Great tips for fashion week! Great tips i would love to go to fashion week next year! Cool tips, thanks for sharing! Hope I could use them in the future when I get to go! Great post! I love to hear about NYFW from all those who have attended. It seems like being organized like yourself is definitely the way to go. Can't wait to see your photos and hear more about it. Thanks for sharing!